My inbox can be an interesting place with lots of PR people wanting to share news of new products and events. This week my award for maddest (and coolest) thing to land in there is details of a crowdfunding campaign for a floating hot tub. I have an inflatable hot tub in my garden which we got last year to replace yet another dead giant paddling pool which hadn't survived the winter in our shed despite said pool being carefully cleaned, dried and packed away. The children love the hot tub and of course it comes with the added bonus of being great for me to relax in when the kids have gone to school or bed and is awesome therapy for my Fibromyalgia which leaves me stiff and painful. It has never occurred to me that you could sit in a hot tub and float along a body of water admiring the view with a glass of something bubbly in the bubbles but of course, it has occurred to someone else and so we have the HotTug. The HotTug is a 3.8m x 2m wood fired floating hot tub, heated at an invigorating 38C of fresh water which ‘HotTuggers’ can operate by themselves. The boat is powered by an electric engine and will be stationed in Old Street this summer at the ‘HotTug House’. The experience, which lasts for 90 minutes is truly unique and is set to be one of the most fun and unusual activities in London. Available to enjoy for a hot date of two or up seven friends or colleagues, the experience will cost £220 per session. 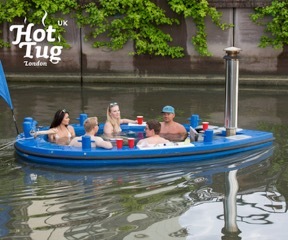 Whether it is a relaxing sightseeing tour or a celebratory birthday party, the HotTug aims to bring a new lease of life to all gatherings, work dos and dates. When founders Tommo and Jack felt they had exhausted London’s ping ping bars and bottomless brunches, they set about finding something that had never been done before. The boys eventual aim is to bring The HotTug to sites across the UK & Ireland to unearth a completely new viewpoint of a city. The crowdfunding campaign on Crowdfunder (http://www.crowdfunder.co.uk/hottug) offers the opportunity for people to be the first to experience The HotTug at an exclusive discounted price of £140. The campaign launched on June 6th and will run for 5 weeks with the aim to raise £10,000. Londoners have gone wild for the campaign, which is already over 50% funded within the first week. This unique and truly different experience is guaranteed to be one of the hottest tickets to get hold of in town. So don’t miss the boat on this truly oarsome adventure! Disclaimer: I was not paid or rewarded in any way to promote this campaign- I just think it's fab!